Sports Business Classroom is excited to announce that Pete D’Alessandro, Assistant General Manager for the Orlando Magic, will be a featured presenter for the 2018 SBC session. 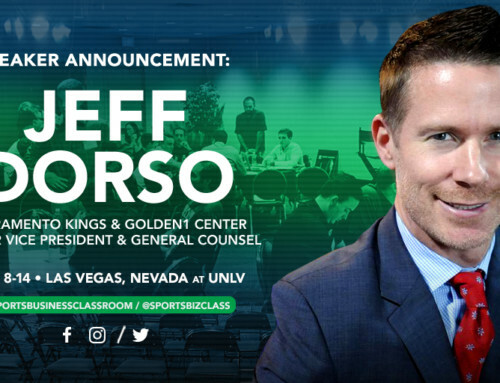 As a featured speaker at the 2018 Sports Business Classroom, D’Alessandro will be part of an all-star lineup of sports business executives that are teachers and presenters. Previous years at SBC have featured NBA Commissioner Adam Silver, Washington Wizards Head Coach Scott Brooks, ESPN’s Adrian Wojnarowski, Ned Cohen of the Philadelphia 76ers, Toronto Raptors GM Masai Ujiri, and the Vegas Summer League’s very own Warren LeGarie. Pete D’Alessandro joined the Orlando Magic as Assistant General Manager in June of 2017 after spending two seasons as Senior Vice President of Business and Team Operations with Denver. It was his second stop in Denver, where he also served as Vice President of Basketball Operations. D’Alessandro also spent twoseasons (2013-15) as General Manager of the Sacramento Kings, and four seasons (2004-08) with the Golden State Warriors. Prior to working on the team side of the business,D’Alessandro spent seven years working at a Washington, D.C.-based sports agency which represented both NBA and international basketball players. A 1994 graduate of Nova Southeastern University School of Law, he was admitted to the New York State Bar in 1995. Pete and his wife Leah, have a daughter, Kate (9) and a son, Ben (6).